Turning a brilliant idea into world-leading packaging is a challenge that is well within the capability of the development team at Ardagh’s glass production plant at Limmared in Sweden. 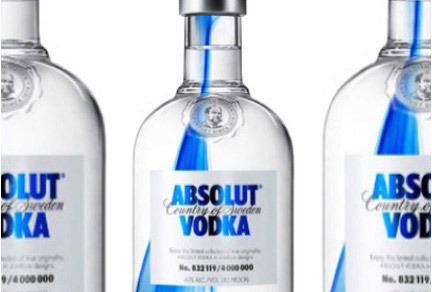 The company that produced the award winning Absolut Unique bottle has in 2013 pushed the frontiers of glass packaging even further with the launch of Absolut Originality. Using partial colouring for what is believed to be the first time on a commercial l scale in the glass container industry, Ardagh has helped Absolut to enchant its customers with yet another cutting edge limited collection of four million individually designed bottles. Each one represents a unique work of art, achieved with a ‘drop’ of cobalt blue infused into the molten glass at the ‘hot-end’ of the production process in Limmared. “We are proud to have partnered Absolut in this innovative development for their 2013 end of year campaign,” remarks Johan Gorter, CEO, Glass Europe at Ardagh. He adds: “The concept takes unique bottle design to the next level, where the decoration is achieved within the glass container, rather than being added to the outer surface of the bottle after production”. To succeed in this challenging project required a combination of skills from Ardagh and its partners, which, in common with the Absolut Unique project, took high volume glass container production to new levels of ingenuity and distinction. Using a carefully prepared cobalt colour compound (frit) supplied by Ferro, and specialised hot end equipment from Füller Glastechnologie, Ardagh’s highly skilled workforce was able to perfect the colouring process over the course of several demanding trials, and then produce the 4 million bottles during an intensive three week period. “The results are fantastic,” comments Mathias Westphal, Global Brand Director at Absolut. He adds: “We took inspiration from traditional Swedish glass craft and made it available to the world. When we watched a drop of cobalt sink into the hot glass for the first time we didn’t know what it would look like. But the very first bottle looked amazing, and what started as a playful experiment ended up as four million one-of-a-kind works of art.